Challenged with vast amounts of data arriving from various sources, operators today need an efficient method for collecting and aggregating data from these sources and converting into an industry standard WITSML format. 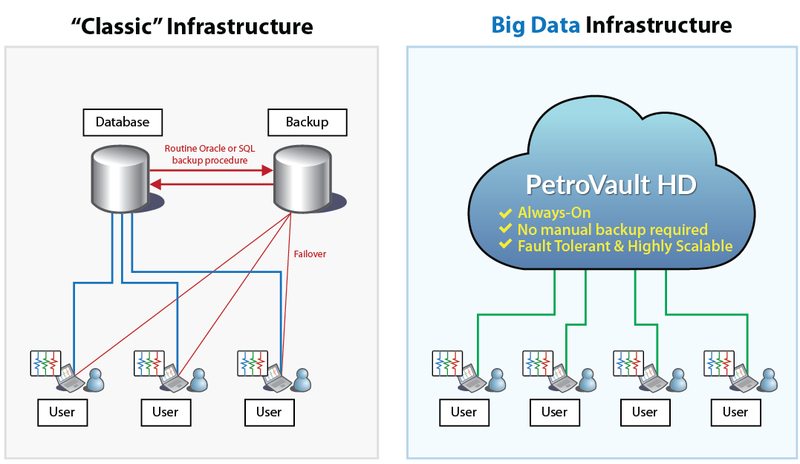 PetroVault is PetroNOC's real-time centralized infrastructure storage and visualization platform that supports all our data management and analytics solutions. With PetroVault, users benefit from a centrally managed solution that consolidates data from all sources, including PetroNOC, service contractors, NOC internal systems and service company data centers. When information can no longer be stored or processed on either a single system, or on "classic" infrastructure, PetroVault HD offers a reliable, scalable, and cost-effective private cloud solution. eliminating the need for complex and tedious backups with Oracle or SQL, PetroVault HD offers premium event-driven architecture and streaming analytic engines enabling data mining with increased speed and agility. The PetroVault HD "always-on" infrastructure based on a combination of supported open source ‘big data' systems and PetroNOC' s proven industry expertise is the best approach to meet requirements of scalability, flexibility, security, and dependability in managing data. PetroVault HD provides a robust, fault tolerant distributed infrastructure which can host all data required for conventional and unconventional drilling, post drilling operations, micro-seismic and potentially, production information. High speed analytics and alerting platform supports optimization, prediction, data mining, simulation and manage by exception, such as drilling ahead of the bit. PetroVault HD supports new end user advanced visualization and engineering applications in real time, 3D, geosteering, anti-collision, and increases the velocity, volume and variety of private cloud big data. PetroNOC also offers the PetroVault HD public cloud.